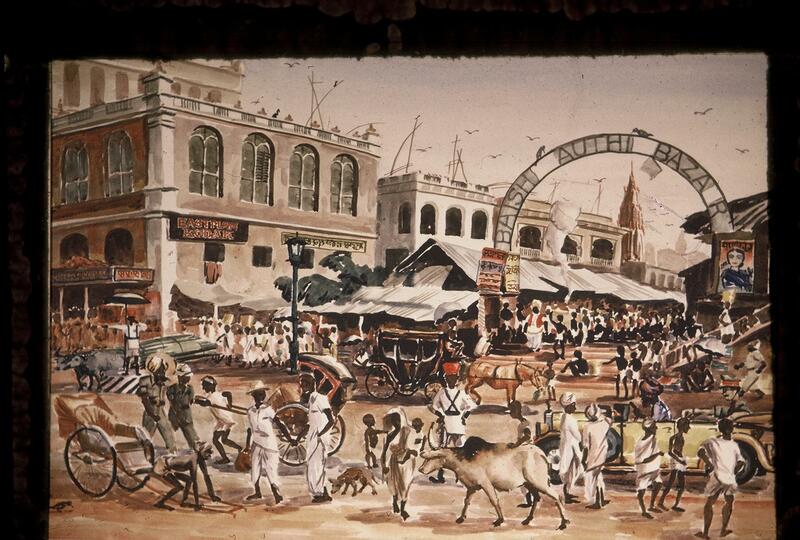 Jazz musician Dave Brubeck’s 1958 State Department tour to India sparked the second chapter in the long and storied life of “Calcutta Bazaar,” an amazing watercolor painted by my father, Vernon P. Johnson from firsthand experience in 1946. Twelve years later, Dad created a second version of “Calcutta Bazaar” — this time on the occasion of a Columbia Records contest memorializing the tour and the Dave Brubeck Quartet’s musically innovative album, “Jazz Impressions of Eurasia,” in 1958. “Calcutta Blues” is one of the songs they wrote and recorded. Vernon Johnson’s watercolor, which vividly captures an iconic portrait of a lost era in India, was lost for more than five decades — until only a few months ago. And curiously it was the Brubeck connection that made it happen. 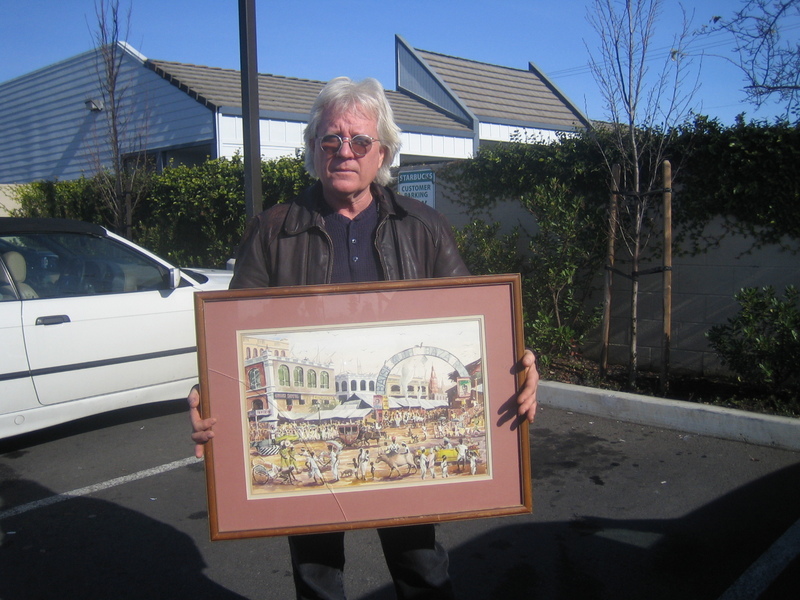 In late 2010, a California musician living in Napa Valley contacted me through this blog about a painting that had been signed by Vernon P. Johnson and dated 11/23/58. His late parents had owned the painting and when he sent a photo, I realized that Keith McKimmie was talking about Vernon Johnson’s “Calcutta Bazaar.” Since Dad also has passed away, I reached back into my memories and recounted how he had entered a watercolor in a Columbia Records contest linked to Brubeck back in the 1950s. As it turned out, Keith’s father had been a regional rep for Columbia Records on both the East and West coasts in those years. Bingo! Before moving to Mount Vernon, Ohio, in 1946 and producing the series of paintings that led to the book “The Artist’s Eye” featured on this blog, Dad served as a pilot in the China-Burma-India Theatre in World War II. His extensive watercolors, drawings and pen-and-inks from that era capture the socio-cultural essence of Indian society during that time, and they are among my cherished possessions because of the quality of the art itself and their historical value. “Calcutta Bazaar,” which he first painted in 1946 from a familiar scene of his war years, is an animated, detailed and perceptive lens on the people and activities who passed through the Baishi Authi Bazaar. 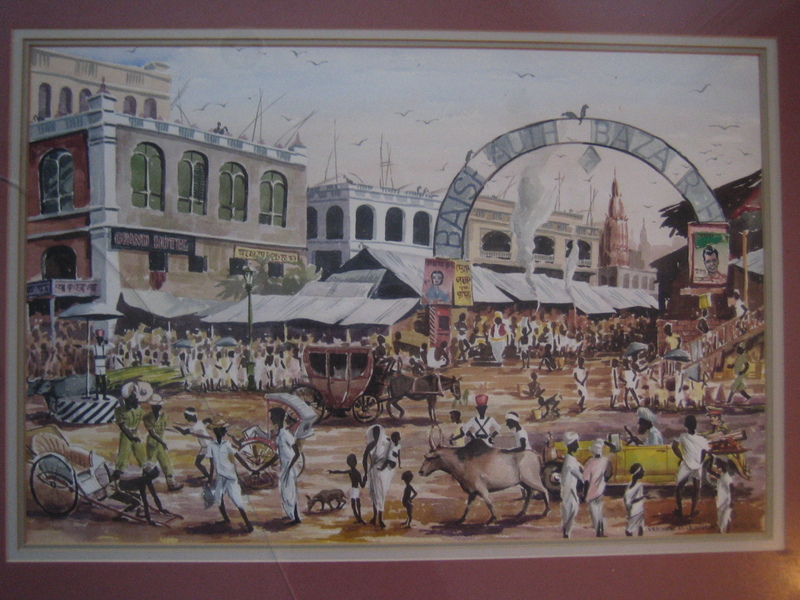 It conveys the noise and voices of the scene — the stately Grand Hotel, uniformed soldiers and women in saris, beggar children, a turbaned holy man, billboards featuring male and female Indian celebrities, a regal bright yellow British convertible and a succession of rickshaws, carts and even a Cinderella carriage drawn by a mule. To advance U.S. diplomacy, the Brubeck Quartet — saxophonist Paul Desmond, drummer Joe Morello and bassist Eugene Wright — took their “Jazz Ambassadors” across the Iron Curtain in 1958 and later to India, Ceylon, Pakistan, Afghanistan, Turkey, Iran and Iraq. In Asia, captivated by the non-Western music, Brubeck incorporated new sounds and rhythms into his evolving jazz style. It was a famous three-month tour — 80 concerts in 14 countries — and the album was recorded at Columbia Records’ 30th Street Studios on July 28, July 30 and Aug. 23, 1958. Brubeck, who still performs today at age 90, is just two years younger than my father, who coincidentally also was a musician — having played throughout his youth and finally settled on the bass fiddle (stand-up bass) to help pay for college with dance bands that passed through Cleveland, Ohio, where he was a student at now Cleveland Art Institute and Case Western Reserve University. I remember him telling me that one of his gigs was with the Sammy Kaye Orchestra. I was in grade school in 1958 and recalled that Dad entered a painting in a Dave Brubeck contest, driving the art work over to Columbus, Ohio, about 45 minutes from our hometown of Mount Vernon. I thought his “verve” pretty awesome, especially since I was taking piano lessons at the time and was already a budding jazz fan. I know that Dad won something — because, as I can best recollect, he received an autographed copy of Brubeck’s groundbreaking album, “Jazz Impressions of Eurasia.” That was the end of that story until just a few months ago. I received an email from Keith McKimmie, who said his parents had passed away; he wondered if I might know someone who would want to buy it. His father Paul had been a regional rep for Columbia Records on the East and West coasts, working with artists like the Everly Brothers and Johnny Cash, and from time to time Columbia would sponsor art auctions. Keith figured that’s how his parents acquired Dad’s painting. “My father and my mother both had exceptional taste and vision concerning art and music,” he said. The painting’s musical connections continue. Keith has been composing and performing music in the San Francisco Bay Area and in his community of Napa in California’s wine country just 30 minutes from where I now live. And Brubeck is from Concord, California, across the Bay, and The Brubeck Institute is located at the University of the Pacific in nearby Stockton. Seems to be some sort of serendipitous alignment here…After my father passed away in 2005, I kept all of his paintings and drawings from India and Burma. In addition to the “Taj Mahal,” his watercolor of “Calcutta Bazaar” was clearly one of his favorites, because he repainted it in 1981. A friend of mine now owns that third version, and they are a close match, although Dad made a few changes. The “Grand Hotel” sign says “Eastman Kodak” in the third version, a sign of the latter times. This entry was posted in Uncategorized and tagged 1940s, 1950s American art, 1950s American culture, American Jazz, American watercolor artists, arts, Baby Boomer history, Calcutta in 1940s, Columbia Records, Dave Brubeck. Bookmark the permalink.